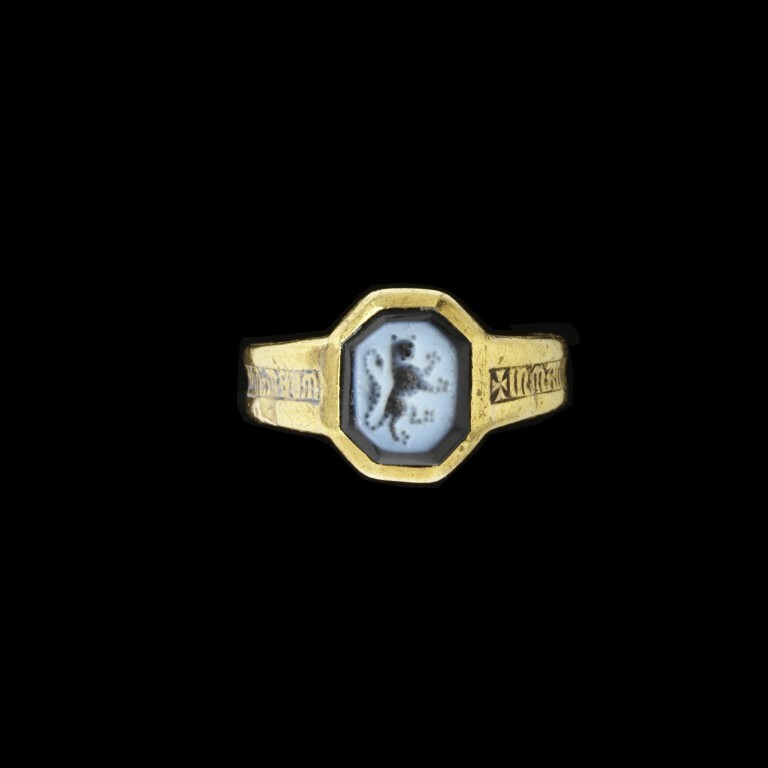 Engraved gold ring with a nielloed inscription and set with an onyx intaglio. 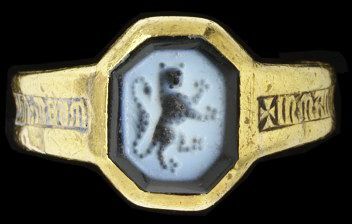 This fourteenth century ring combines a heraldic lion, probably used as a signet, with a Christian phrase. 'In manus tuas domine commendo spiritum meum' (Into your hands, O Lord, I commend my spirit, Luke 23:46), the words spoken by Jesus before his death on the Cross, are engraved around the hoop. Religious phrases, sometimes combined with magical names and invocations, were written on parchment and worn as amulets or engraved on jewellery and worn close to the body. They were believed to protect the wearer against both physical and spiritual dangers. Rings are the most commonly surviving medieval jewels. They were worn by both sexes, across all levels of society. Some portraits show wearers with multiple rings across all their fingers. Although rings were worn for decoration, they also had important practical functions. Signet rings such as this one were pressed into sealing wax to create a unique, legally recognised signature. Personal seals (secreta) provided an essential legal safeguard and were used to witness documents such as wills, deeds of gift, loans and commercial documents, personal letters and land indentures. Nielloed gold signet ring with an octagonal bezel set with an onyx intaglio of a lion rampant with the initial 'P' behind. The hoop inscribed in lombardic characters +IN MANUS: TUAS: DOMINE: COMENDO: SPIRITUM: MEUM.. The outer edges of the ring are decorated with a nielloed chevron pattern. Inscription in lombardic characters around the hoop. Initial P behind the bezel. Historical significance: 'In manus tuas domine commendo spiritum meum' was cited in a Roman Pontifical of the 13th century as a phrase to be used by a penitent as part of a rite of absolution. The phrase, an expression of surrender to the will of God, may have been paralleled in the feudal ceremony of commendation. (cf. Images and ideas in the Middle Ages:selected studies in history and art, vol 2, ed. Gerhart B. Ladner, 1893, p.225). 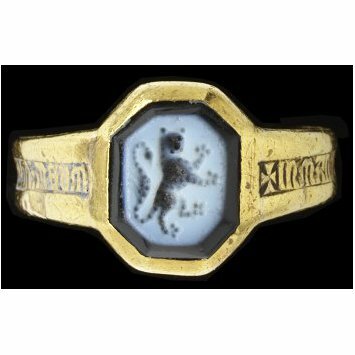 Nielloed gold signet ring with an octagonal bezel set with an onyx intaglio of a lion rampant with the initial 'P' behind. The hoop inscribed in lombardic characters +IN MANUS: TUAS: DOMINE: COMENDO: SPIRITUM: MEUM. ('Into your hands O Lord, I commend my spirit'). Italy, 1300-1400.